ANA Granite, LLC in Flint, Michigan offers beautiful kitchen countertops, bathroom vanities, fireplace surrounds, tub surrounds, table tops and desk tops. When fabricating your countertops we take the veining and direction of the granite into consideration to ensure that the stone in your kitchen is sturdy and designed beautifully, at no extra cost. We will fabricate your granite countertop as large as the slab size and access to your job will allow, creating less seams. This attention to detail makes a big difference in the look of your countertops. Since granite is a natural material slabs vary in color and veining. One of the great benefits of choosing granite is that your countertop, vanity, or surround will be one-of-a-kind. 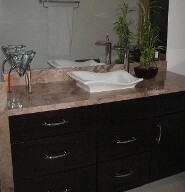 Installing a granite or marble vanity, tub or shower surround is a great way to update your bathroom. A bathroom renovation will not only add style and beauty to the room and increase your enjoyment of it, but it will also increase the value of your home. To create a customized appearance, we build a granite surround around the existing fireplace. A large selection of marble and granite is offered to ensure that your fireplace is exactly how you want it. Contact us today at 810-625-4630 for more information about our beautiful kitchen countertops, bathroom vanities, and fireplace surrounds.